I was born into darkness. Terrifying sounds surrounded me, enveloped me. A hissing noise, then gurgling, then—at last!—a gentle sizzle. My face, pressed flat against some hard surface, was burning, my pores clogged with some sort of oil. Suddenly, a cool object slid under me. With elegance and speed, I was flipped onto my back. Before I could adjust my eyes to the blinding light, more thick liquid was poured onto me. Waiting for the liquid to clear, I began listening. The deafening cracks and whistles around my body began to vanish as I heard an even more horrifying sound. My vision now halfway decent, I located the source of the muttering. A giant blob with dark fuzz on its head and two moving limbs. Staring at me. It seemed angry. At me. What was I already doing wrong? Did it just insult me? I tried to spit at it with the oil still in my face, but the hot liquid barely made it out of the dark cell that I was trapped in. Am I a latke? I thought to myself? Lat-ke. La-tk-e. Latke. I liked the sound of that. But before I could further swish the sound of my new name in my minuscule mouth, the angry blog seized a wide stick and aimed it in my direction. ALL RIGHT, THAT’S HOW YOU WANT TO BE, HUH? I yelled. I planted myself firmly to the ground. The blob struggled. Oh, how I LAUGHED to see such agony and pain. The blob was stronger than I thought. After a decent three counts, my grip began to falter. The blob took full advantage, first by loosening my sides, before attacking my center. I hopelessly released my grip, certain that sudden doom would be upon me. As I was picked up and strewn through the air, I was shocked at what I saw below. Tiny blobs—I’m assuming the origin of the high-pitched nonsense—looked happy at the sight of me. They weren’t angry, like the soft talking blob with the big stick. They were delighted. “APPLESAUCE,” it boomed. Seemed like a fitting name for its unfortunate disposition. A whisper snuck from behind APPLESAUCE. “and I’m sour cream.” Lo and behold, situated behind APPLESAUCE’S bulbous body, was a smooth, saucy looking substance, white as sugar. It was not as sweet as sugar, as it turned out. “They’re gonna eat us,” it stated. “The kids.” I looked to my right and there they were. Those happy blobs weren’t just happy. They were hungry. Time: Using one pan: 1 1/2 hours. Using a griddle or 2+ pans: 45 minutes to 1 hour. Go with option 2, people. Shut all bedroom doors and open some kitchen windows. Trust me on this. The grateful shred. Grab a medium-sized bowl and a grater. Shred the zucchini over/into the bowl. Then add 1 teaspoon salt and mix. Let sit for 10 minutes. *Note 1: zucchini releases an incredible amount of water. The salt helps bring it out so you be rid of it later. *Note 2: No need to peel the zucchini! The skin gives it some good color. The grateful shred: re-animated. While the zucchini schvitzes (or “sweats” in Yiddish), mince the onion and add it to a large bowl. Then peel and grate the potatoes into the onion bowl. H2-N0. The zucchini should be done by now. Squeeze the water out of the zucchini in batches using kitchen towels. Don’t use paper towels, it takes forever. Once your zucchini is dry, add it to the large bowl along with the potatoes and onion. *Note: if you completely flatten the zucchini, it releases its water better. I’ll hand you this one. Now add the parsley, pepper, and garlic to the large bowl. Using your hands, mix all vegetables and spices well. Then add in the dry ingredients (flour and baking powder) and mix by hand again. Griddle me this. Seriously, you’ll want to use a griddle or multiple pans for the next step. I used one pan and it took FOREVER to cook all of the latkes. It wouldn’t be Chanukah without some oil. Start with 1/3 cup canola oil in each pan. Turn heat to medium. Once the oil starts to shimmer, it’s ready. *Note: you’ll want to use a splatter screen. It’ll stop the oil from getting everywhere. 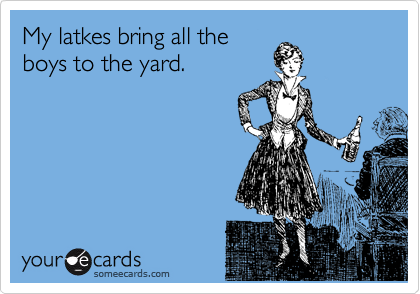 Otherwise, wear a long sleeve shirt. Have a frying frenzy. Using a 1/2 cup measuring cup, scoop the latke mixture into the pans/griddle. Flatten each latke with a fork until you achieve the desired thickness. Cook on each side for 2 minutes. You’ll know the latke is done when it gets golden-brown and crispy (yum). *Note: Keep adding oil so each latke is always simmering. Latkes on the run. Transfer latkes to a paper-towel lined plate. (It’ll soak up all of the extra oil). As is tradition, eat all latkes with sour cream and applesauce. The Eastern Europeans were really on to something here. Hey remember how I told you to close all of the doors of your house and open a few windows? Yeah, that was to prevent your entire place from smelling like latkes for 2-3 days. You’re welcome. 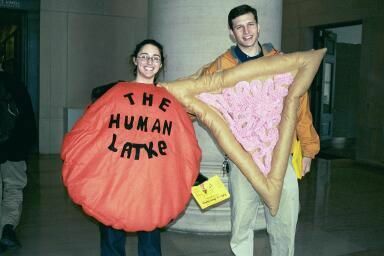 Want to be a latke? Click here to see how. Want to be a fancy latke? See your competition.